The claim comes after it emerged that the veteran unionist politician has quit as a member of the Orange Order. Reports in newspapers today suggested that the Upper Bann MP had bowed to pressure from within the Order to resign, following his alleged illicit affair with a party colleague. While the Orange Order offered no comment on the matter, a source close to the institution told the News Letter it was Mr Simpson’s own decision to resign, and that he had not faced any internal pressure to do so. We understand that Mr Simpson tendered his resignation last week and it has been accepted by the Order. Reports in the media have also suggested that Mr Simpson – a devout Free Presbyterian who has been married for 37 years – could be pushed out of the DUP in the wake of the controversy. But the party’s headquarters dismissed the speculation, stating it was “all fairly baseless”. A DUP spokesman said: “I am not sure where this is all coming from but it is not based in fact. “There is no pressure being put on Mr Simpson to resign and there is no indication he intends to do so. Just last month, Mr Simpson was reappointed Worshipful Master of the Houses of Parliament’s Orange Lodge. It has been reported that one of the members who proposed Mr Simpson for the role was Strangford DUP MP, Jim Shannon. When contacted, Mr Shannon told the News Letter: “I will be making no comment about that. “It was a decision within the privacy of the Order and that is where that business stays. Local party members have also adopted a similarly tight-lipped approach. The News Letter contacted a number of DUP councillors, and the two who did respond directed any queries to party HQ. The News Letter attempted to contact the MP multiple times today, but we received no reply. 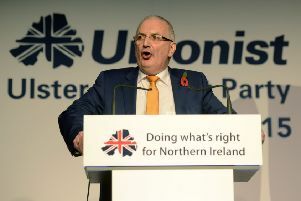 Mr Simpson has been the MP for the Upper Bann constituency since winning a hotly contested battle with incumbent MP David Trimble in 2005.